There are also live performances from Squadron, Stigger, Kraftschlag, Germania, Svastika, Heysel, Odium, Heroes in the Snow, Nibelungen and Midgårds Söner. 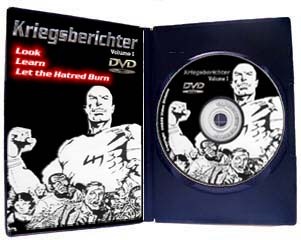 Also included in the original Kriegsberichter are Zine reviews, advertisements, DNSB Report, marches and riots and what I consider to be the best tattoo segment out of all the videos. You will certainly appreciate this volume much more after viewing the remarkable "evolution" that this series has taken through their first few editions, but nevertheless, it is well worth the money!